Imagine taking a punch from a professional-grade boxer. I'm not talking about one of those Mayweather jabs from out of nowhere that leave you woozy. The kind of hit I'm talking about is a George Foreman-sized power hook that you see coming from a mile down the road, but the broad sweep and sheer power behind the man's fist stuns you even before it knocks flat out. Southpaw, the latest film directed by Antoine Fuqua and the first feature written by Kurt Sutter, offers up that latter type of punch. A gritty sports drama blended with Sutter's level of hard-hitting melodrama, the film digs in exactly where you expect, but it does so in all the right ways. Southpaw is as subtle as a haymaker, but, damn, if it doesn't hit just as hard. In the film Jake Gyllenhaal is phenomenal as Billy "Great White" Hope, the light heavyweight champion of the professional boxing world. Billy has gone 43-0 in his career, most of these fights a success due to his ability to take more punches than the other guy. He lives with his beautiful wife (Rachel McAdams) and loving daughter (Oona Laurence) in an enormous mansion, and, apart from early signs of brain damage, he sits like a king on top of the world. Things are about to change for poor, poor Billy Hope. Tragedy strikes first when his wife is taken from him, the victim of a stray bullet fired during an altercation between Billy and another fighter. His inability to grieve properly causes his fighting career to suffer, and, soon, the courts decide to separate him from his daughter. Having worked his way to the top only to lose everything, Billy must start from square one again, and he begins training with a former boxer (played by Forrest Whitaker) to reclaim his title and custody of his daughter. Things are about to change once again for poor, poor Billy Hope. It isn't difficult to predict the trajectory in which Southpaw's narrative structure will follow. Sutter's tale of redemption moves right along its expected track, rarely diverting from its main focus of Billy's fall from grace only to rise up again. This is clearly not an issue here. Sutter, as he showed us with seven season of "Sons of Anarchy", knows how to amp up the drama when its necessary. With Southpaw, he delivers a story full of grit and grime, and I'm not talking about the visual atmosphere. These are extremely gray-area characters. It's not so much the case with his wife or daughter, but Billy Hope is a hard character to like, a socially unrefined scrapper who makes bold attempts at fitting in with his current, financial stratum but who could deck a guy in a hotel lobby if that guy is to say the wrong thing about Billy's wife. Sutter goes to great lengths to show us the cause-and-effect correlation that comes from Billy's actions, his struggle for redemption made all the more powerful by the intrinsic nature of it all. Sutter's screenplay also has room for turning up the stylized glitz and glamour that generally comes from professional boxing bouts. To make it all flow in unison is director Antoine Fuqua, who may have been the ideal choice to bring Sutter's sledge-hammer of a screenplay to cinematic life. Read nothing into the fact that Southpaw begins with Fuqua Films' new, shimmering, gold logo. Fuqua has never been a director to exercise nuance – His ability to surprise audiences peaked when we realized Denzel was the bad guy in Training Day – and his apparent cynicism always appears to bleed into the visual world he's creating. Southpaw definitely holds back on the cynicism. There's just no room for any more of it here unless you're going full-boar tragedy. Fuqua's style blends perfectly with Sutter's screenplay, the harsh contrasts in colors as raw and as evident as the harsh ups-and-downs of Billy's life. Fuqua even raises his action game in the boxing scenes, and the brutal imagery along with some beautiful editing and sound design rank them up there with the best put to film. I'm looking at you, Rocky franchise. It certainly helps that Southpaw's protagonist is portrayed by Gyllenhaal, an actor who continues to amaze and surprise with each role he takes on. He shows off a charming-but-dumb turn early in the film, the kind of guy who gets away with more than he should, because he's just too cute when he flashes a smile. It's in the darker undertones, though, where Gyllenhaal gets to play with the part. He broods with an intensity, and, when he finally goes off like you know he will, you don't want to be anywhere near it. 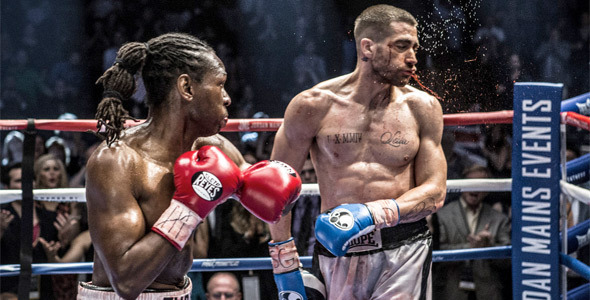 Southpaw marks yet another tour de force performance from the young actor, and there isn't any indication the Gyllenhaal Express will be slowing down any time soon. Fuqua lines up an outstanding, supporting cast behind Gyllenhaal. Whitaker stands out with his own brand of intense brooding. It's something of a typical part in this kind of script, but Whitaker's sense of humor bleeds through. He ultimately gives an outstanding performance in a role that could have been sleepwalked through. McAdams is great in her small role, and Laurence is just as impeccable as Billy's daughter. Curtis "50 Cent" Jackson pops in now and then giving a solid performance as Billy's manager – nothing shady about this character at all, nope. That's really the only drawback to Southpaw. Its predictability stems from the fact that boxing dramas such as this come around frequently. Sutter takes the story down some unpredictable avenues, especially early on, but never too far that it can't turn itself around and course-correct to more familiar territory. What sets Southpaw so high in this area is the execution it delivers on all fronts. That includes the choices Sutter's screenplay makes. We know from what direction its punches will be coming, but the drama, visualization, and strength of its cast help Southpaw deliver a flurry of genuine emotion to its audience. Disappointing. // Thanks for the review Jeremy. Back to no capitalization ? haha! oké, I will do it from now on! Sounds exactly like it seemed from the trailer. Solid performances from all sides but brings nothing new to the table. Since it is not a sequel or a reboot and is done well, there's no reason to complain... And I'm a sucker for boxing, Fugua and Gyllenhall. So I will def see this. just a point of clarity - its full-bore, not full-boar. Otherwise, carry on. I'm a big fan of Fuqua's work. I love the grit that he imbues in his work. Like a modern day, somewhat urban Sam Peckinpah. GREAT MOVIE B+ !!!!! great acting !!! But 50 cent could've did better acting than that !!!! Hell John Cena and T.I. do good jobs when they show up in other movies !!! !